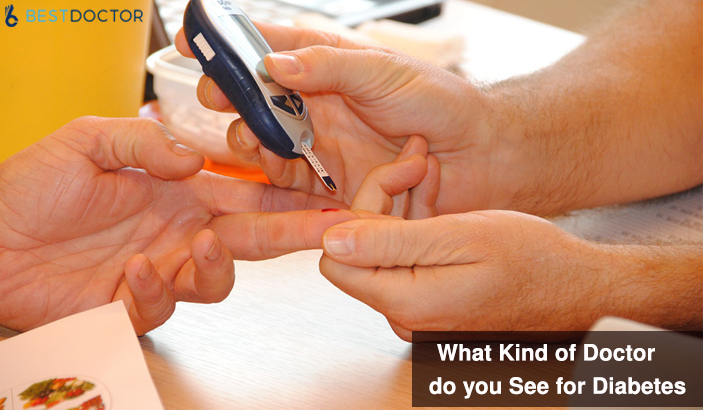 Home Blog What Kind Of Doctor Do You See For Diabetes? What Kind Of Doctor Do You See For Diabetes? Diabetes is one of the most common issues with older people today. If you are suffering from the disease, you might be looking for the best doctor for diabetes. Well, it is important to know what kind of doctor you should see for diabetes. It is necessary to keep the sugar level in blood to safer levels, besides taking other measures to treat the disease. Today, a number of healthcare centres have come up with effective strategies to keep the problems under control. You also need to take care of your diets to keep the sugar level low. In most of the healthcare centres, the team of doctors for diabetes consist of a dietician, a general physician, a podiatrist, a doctor for eye care and a dentist. Certain organizations, even have their in house fitness trainer to take care of the diabetic patients. However, you need an endocrinologist to look after your health if you have diabetes. Why Do You Need an Endocrinologist? An endocrinologist deals with hormonal disorders. As the root of diabetes lies in the disorders of the endocrine system, you need an endocrinologist to maintain your health condition. You may Ask an Endocrinologist the necessary measures to keep the body fit and check the hormonal flow. Diabetes is caused due to the lack of insulin in the body. The fats in the body are unable to use the insulin produced by the pancreas. Under these circumstances, the best doctor for diabetes help out the patients by providing more insulin to the body. The hormone has to be externally injected into the body in order to keep up the necessary level. The endocrinologists treat the hormonal conditions of the body and prevents the condition from deteriorating. Not all the people suffering from diabetes need to see an endocrinologist. Certain people are able to control the disease with help from the general doctor. However, you might Ask a doctor when you need to see an endocrinologist. You need to visit an endocrinologist when you are diagnosed with type 1 diabetes. Under these conditions, the diagnosis is fresh and you still keep learning about your health conditions. People who have type 2 diabetes often need to go to an endocrinologist. They may find it difficult to manage their complications and the support from these professionals help them out. You might have understood the role of an endocrinologist in treating diabetes. It is recommended to seek their help in the initial stages, so that you can get the right treatment from the beginning. Diabetes brings about a lot of complications in the body and you need assistances from different departments to maintain your health conditions. It is necessary to seek the assistance of the best doctor for diabetes to retain good health. When Do You Need to Go to The Best Doctor for Diabetes? You might start the treatment with your general practitioner, but eventually, it might be necessary to seek the opinion of a specialist. In these cases, you need to reach out to the best doctor for diabetes. You not only get a online medical second opinion regarding the treatment from these specialists, you also get better treatment facilities. Most of the time, your doctor will refer you to a specialist after you are diagnosed with the disease. This is done to confirm the diagnosis. You can also consult a specialist to know about the various treatment options available for you. You might find that your physician does not have enough experience in treating diabetic patients. Under these conditions, too, you need to see an expert. You may also go to the healthcare websites to get an expert opinion. If you want to consult with the specialists, you can go to bestdoctor.com and get a second opinion. Patients need substantial training and education to keep the disease in control. You might find that your physician is unable to provide you with the necessary educational materials. It is necessary to reach out to the best doctor for diabetes to get the desired support. It will help you to manage diabetes in the right way. You should have a consultation with the best doctor for diabetes to deal with various complications arising from diabetes. These may affect your eyes, nerves and kidney. In order to prevent damage to these organs, you should see an expert. You may also experience sores and deformities in your feet. The experienced online doctors help you to deal with these issues and manage your health conditions. Next PostWhen You Need an Orthopedic Second Opinion?